Jack Horwood is a card-carrying coffee addict. And three years ago, when the first book telling Jack’s story came out I was toasting him on his way with an outsize mug of coffee. It seemed only fitting. Today, book #4, Swings & Roundabouts, is out. And because it’s more of a Gareth book – in my mind, at least – I chose something a little different to celebrate. Something that you might remember from the moment you met Jack all the way back in Job Hunt. 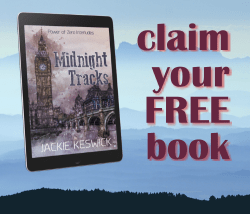 Jack Horwood drifted with the flow of pedestrians—mostly tourists and visitors to the capital with the odd office worker out on an errand—past the Savoy Hotel and on toward Simpson’s-in-the-Strand. The buzz and bustle reminded him of the morning after his viva exam when he and Tom had decided to treat themselves to a proper breakfast after a night out celebrating. And how that simple decision had turned into the grandest, biggest, and most magnificent breakfast the two had ever seen. Or eaten. I’m sure you’ve guessed it. To celebrate the release of Swings & Roundabouts, my husband and I had dinner at Simpson’s-in-the-Strand. I’d been wanting to do that for a very long time, but it never seemed to be the right occasion. Until it suddenly was. 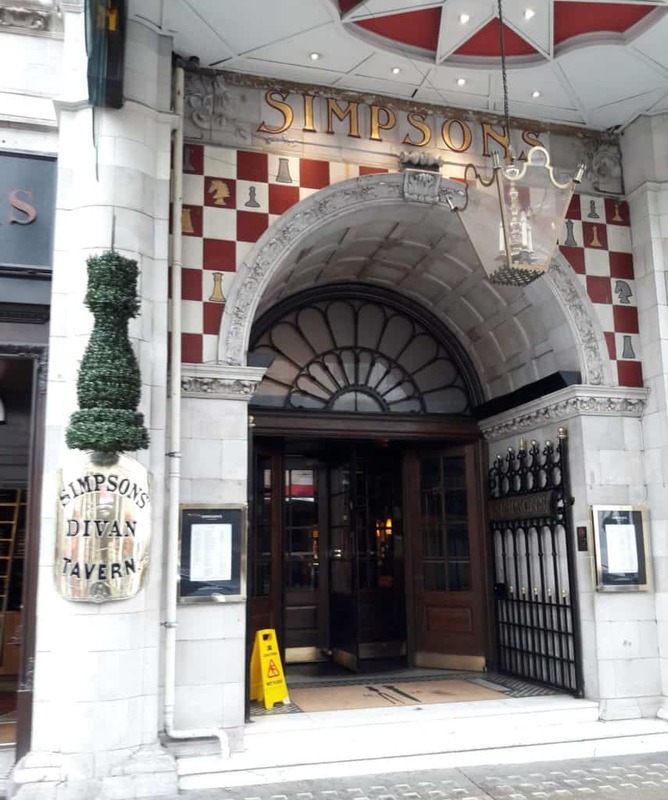 Simpson’s is one of London’s oldest restaurants. It dates all the way back to 1828, when it began life as a chess club and coffee house. Food was eventually added to the cigars and coffee, and roasts were wheeled through the restaurant on silver-domed trolleys and carved right beside each each diner, so chess matches could continue uninterrupted by the munchies. Simpson’s gained a reputation for excellent traditional fare and – did you know? – even Sherlock Holmes and Dr. Watson (the real ones!) were fans and dined here. 😉 Though women were not allowed in Simpson’s Grand Divan until 1982! I blog about traditional English food in real life, so given that and seeing Simpson’s is just up the road from the headquarters of Nancarrow Mining, and Gareth is as invested in food as Jack is invested in good coffee… Simpson’s was an easy choice for a place where Gareth would go for meetings, or just to get away from the herd of cats that’s his Corporate Security team. Simpson’s is old-style and when Jack & Gareth’s story starts, it’s still very much in the style and state it’s been in since 1903. It’s famous for serving one of the best traditional breakfasts to be had in London, including the famous “Ten Deadly Sins” – which Jack, of course, can’t leave uneaten. Breakfast had been magnificent, Simpson’s kitchen doing full justice to the famous meal they called The Ten Deadly Sins. Jack had devoured Cumberland sausage and baked tomatoes, indulged in liver and bacon, black pudding, and mushrooms, and followed that up with bubble and squeak, fried bread, scrambled eggs, and baked beans. When toast, jam, and various pastries appeared on the table, Jack was convinced he wouldn’t need to eat for the rest of the weekend. Now, the table in front of him was a splendid ruin, with Gareth—looking like a sleek, well-fed cat—presiding over the teapot. Simpson’s had a refit in early 2017. And it wasn’t just a makeover of the dining room. The menu got an overhaul, too, and – as of right now – Simpson’s aren’t serving breakfast, just lunch and dinner. I’m not sure what Gareth will say to that when the story finally catches up with the times. The lack of the famous breakfast menu aside, the place is lovely, the service impeccable and the food fantastic. We thoroughly enjoyed ourselves. If you want to experience traditional English food in ultra-traditional surroundings, give Simpson’s a try. While there’s plenty of food in Swings & Roundabouts – there always seems to be when I start writing – Jack and Gareth don’t make it to Simpson’s in this fourth installment of the Power of Zero series. But they will definitely head back there soon. And so will we. 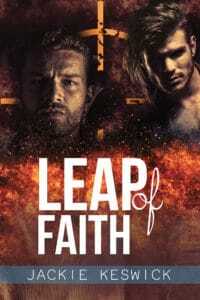 For the moment, Jack and Gareth have some problems to iron out, two teenagers to look after, and (maybe) a murder to solve. And while Jack is happier than he’s ever been, Gareth doesn’t seem to be on the same page and Nico’s moodswings give him whiplash… a challenge for Jack if there every was one. Whether he’s fed and caffeinated or not. 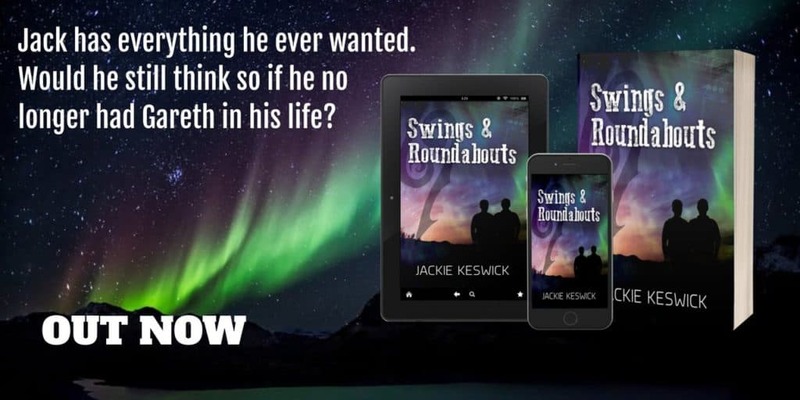 Swings & Roundabouts is available as ebook and paperback from all popular retailers. You can find out about the whole Power of Zero series by clicking here. And you can read the blurb and an excerpt from Swings & Roundabouts on this page. I hope you enjoy watching Jack & Gareth edge a little closer to their HEA. definitely add this to my list of places to go on our trip to England! I still have a year and a half to map it all out. I would definitely recommend it! 🙂 Even without the famous breakfast.